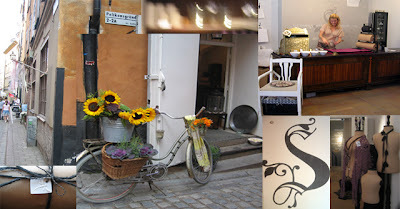 Södermalm is a lovely neighbourhood with many interesting shops, but the one that really caught my attention was S. in Gamla Stan. I drifted in and was lucky enough to have Sara's mum show me the whole newly refurbished space. The gallery downstairs, a lovely workspace and of course the shop and the so nicely presented things. Sara opened up the doors of her shop three days ago, she is a children's book illustrator and you can feel that this space will have the same Ludic charm of her illustrations. One of my aims with vonblum, is to create a connection with other creative people and stores. So I guess that meeting Sara was a great first step towards that! Looking forward to exchanging experiences and ideas.